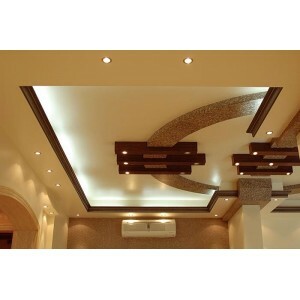 This is another very common and useful form of false ceiling. The procedure is similar to POP ceiling. The difference is that there is no need of the net and the messy work of POP paste. After installing the metal grid of the ceiling, gypsum boards are fixed on the grid to create the ceiling. Any type of straight line designs can be created using these boards. But these straight line designs can create wonders on your ceiling. You can see the pictures to understand the options which can be created using the Gypsum Boards. Pros (Advantages) • The Gypsum Board ceilings can also create seamless finish. The joints of different boards can be covered using the jointing compound and cover tapes. When nicely done, these ceilings gives a very straight and wonderful look to any place. • Many designs can be created using this type of material. Creating domes on the ceiling may not be possible. • The life of the ceiling is very good and performs wonderfully. • Economical in cost. • Easy to install and the work is relatively clean and easy in comparison to POP ceiling. Cons (Disadvantages) • Any repair work of services under the ceiling if required to be done in this type of ceilings is quite difficult. The ceiling needs to be broken. • The joints of the board may show sign of cracks with passage of time. • The corners of the ceiling where ceiling meets the wall also may develop crack lines. • Workmanship is the key. If the installer is not experienced he can spoil the finish.